I want to start this off by saying that I am an incurable Noodler’s ink fan. I believe the company, with very few exceptions, makes inks that make the everyday usage of fountain pens possible. The wide array of colors, fraud/water resistant specialty inks, and constant innovation are invaluable. I honestly, don’t know where our hobby would be without Noodler’s ink. I will forever be a fan. Having said that, I must admit that I am terribly disappointed in Nathan’s latest creation , The Bluenose Bear. Perhaps this ink is a victim of misdirected marketing or over-hype. At particular issue here is the claim of a lighter, brighter blue outline/halo around your line when you use a flex pen. Nathan has been hinting at creating such a novelty ink for a couple years now. I, for one, have been eagerly awaiting its debut. Unfortunately, that feature is inconsistent at best and unattractive at worst. On the other hand, Bluenose bear is quite a nice blue-black color with a bit of a green hue. The color of the ink itself is very similar to Noodler’s Coral Seas, an Australian exclusive ink. The “outline” is a much brighter turquoise sort of blue. This ink exhibits some of the worst feathering and bleeding I’ve seen in a Noodler’s ink. The flow and lubrication are average. The shading is excellent. The ink produces a bright blue outline/halo where the line is the most saturated. This ink is not 100% waterproof, but there is a grey component that remains on the page. While I had high hopes for this ink, I have to admit that I was concerned that the blue halo might look a bit too much like feathering for my tastes. Unfortunately, I was right. The bright blue component of this ink behaves quite poorly. Presumably, this is what makes the halo effect possible. 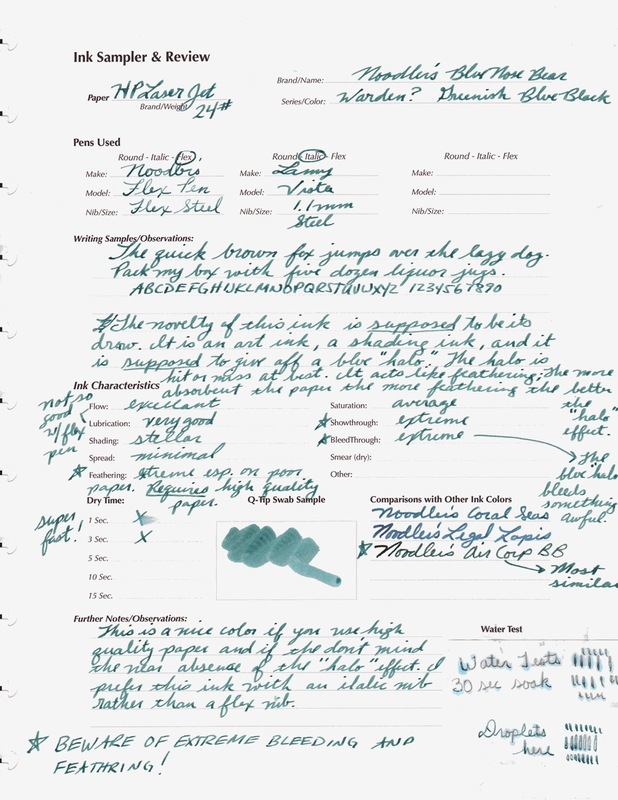 On certain papers, the bright blue component separates from and spreads out beyond the blue-black line thus giving the impression of an outline/halo. The outline is by no means smooth. It is jagged like one would expect from feathering. It is also inconsistent. It jumps out here or there depending on the amount of ink put down. Below are two samples of the “halo”. “Xerox” is written on 24# Xerox multi-purpose paper. This is typical office paper stock. 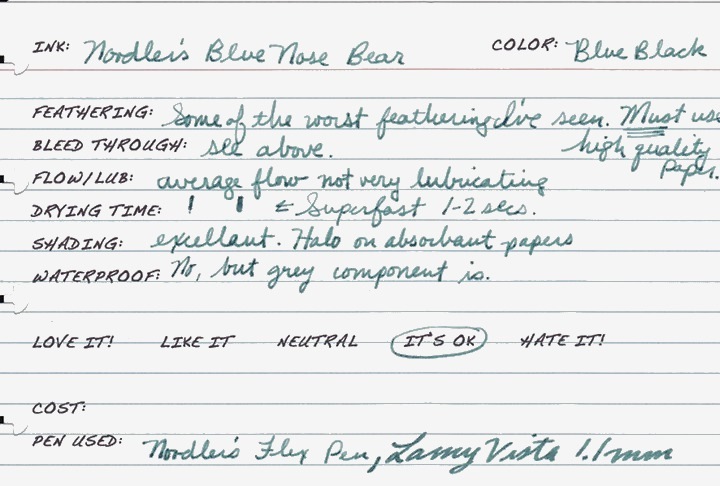 This paper is generally quite fountain pen friendly, but it seems to bring out the worst in Bluenose, and, consequently, displays the halo best. “Rhodia” is written on a Dot Pad. Bluenose is better behaved there while still showing some halo. That same bright blue component of the ink tends to bleed if enough of it is put down on the page. When I say bleed I do mean bleed. In some cases, it will go through to the next page. Here, again, are the words “Xerox” and “Rhodia”. 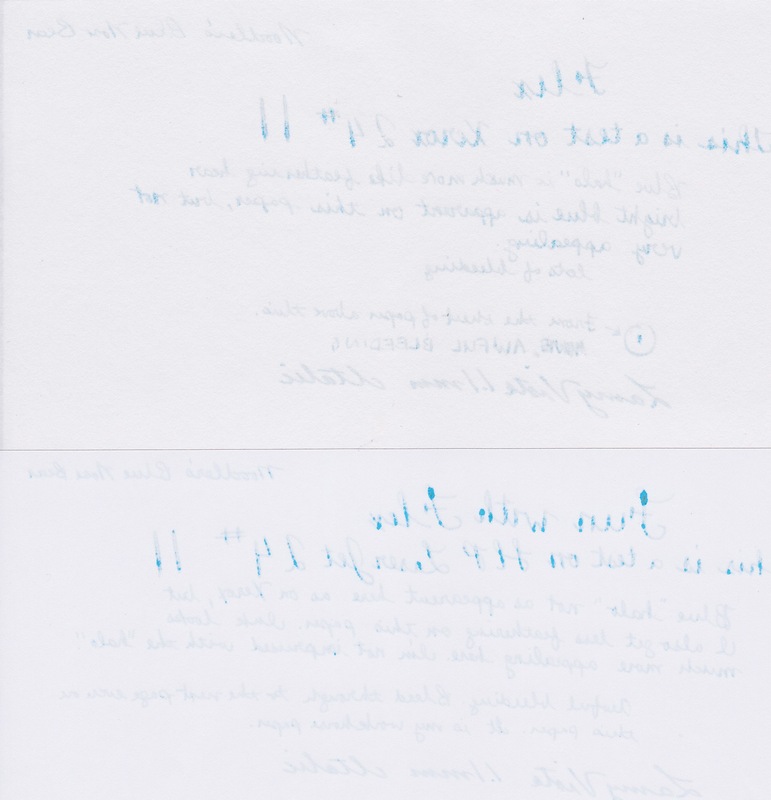 I am also including a full scan of the back of two office papers sheets. As you can see, the bleeding is awful on the office paper, but tolerable on the Rhodia. However, it should be noted that it is very difficult to get an ink to bleed through (or feather) on Rhodia paper. This ought to give you an idea of how pervasive the problem is. The flow is good to average. 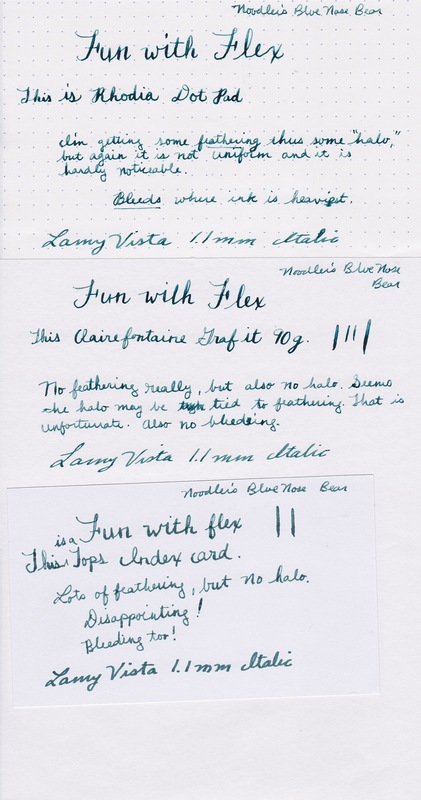 I’m still getting used to the flex pen, so I had some railroading issues in some of the samples. That was my fault not the ink’s. Lubrication is also average. The flex nib is quite scratchy at times. That is the nib’s issue, but it would be nice if the ink has more lubricant qualities to help smooth the nib out a bit. Bluenose dries almost as soon as it hits the page. This was true of all the papers I tested. Now, the shading of this ink is phenomenal, but with it can come feathering and bleeding. If you use high quality heavier papers (like the Clairfontaine Graf It pad or Crane’s Choice) and a juicy stub italic nib you can get some truly amazing shading with minimal feathering and bleed through. If you are an artist, I’m sure you could achieve wonderful results with a brush pen. I need to do some further testing, but I’d place this ink in the near bulletproof category. The blue-black color washes away, the bright blue fades and spreads, but a grey line remains. Perhaps this ink is better suited for the artist rather than the conventional fountain pen user. 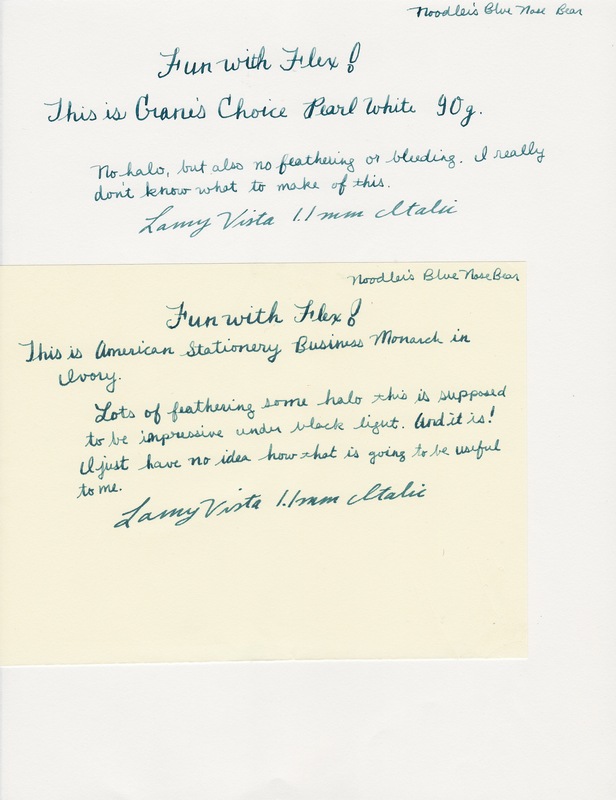 As Nathan promises, this ink does glow when used on IVORY paper and viewed under a black light. The ink also shows some interesting variations when swabbed that might yield interesting result if used with a brush pen. All in all, I am not happy with this ink. I have no intention of buying a bottle of it. It is just too ill-behaved to use for writing. If you are like me and you can’t abide feathering and bleeding you might seek out the aforementioned Australian Noodler’s Coral Seas as a suitable substitute. However, note that it is whopping $32. Below are more writing samples. I wrote on the following papers using a Noodler’s Flex pen and a Lamy Vista fitted with a 1.1mm Italic nib: Xerox 24#, HP LaserJet 24#, Clairfontaine Graf It 90g, Rhodia Dot Pad, Crane’s Choice 90g, American Stationery Business Monarch in Ivory, Tops 3 x 5 blank index card, and Tops 4×6 lined index card. And I have to say it was sadly amusing to watch Brian Goulet stammer his way through a video on this product, looking for something positive to say. As you point out, it seems more suited to use by artists as an ink wash than anything else. I’m not even very fond of the color; seems muddy to me. Ouch. Just… ouch. I love Noodler’s inks, but I am quite thankful for your warning. Ouch? I really tried not to come off as too harsh. 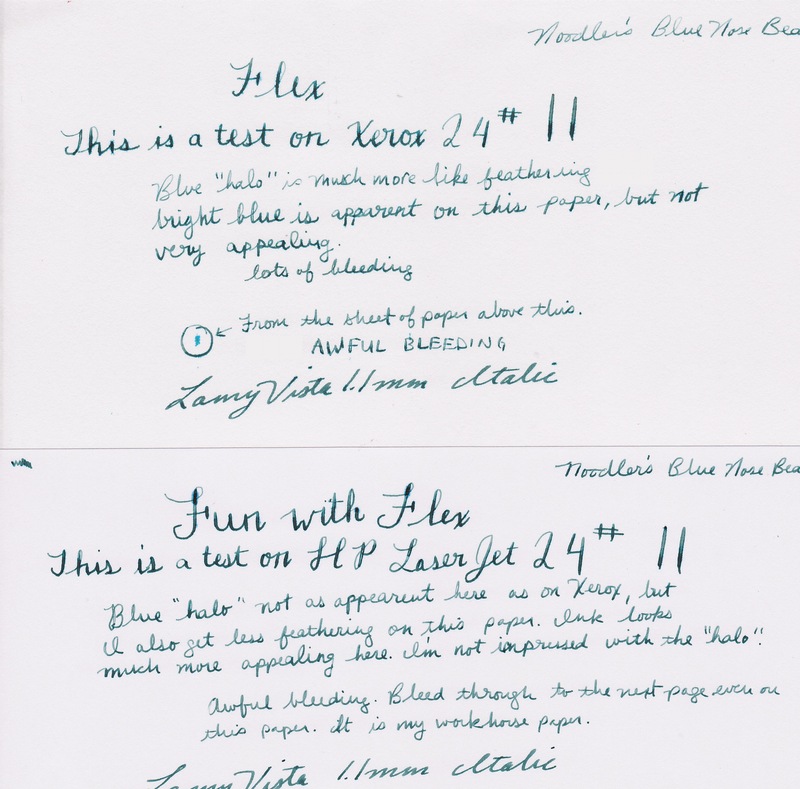 I really do love Noodler’s inks, but this one is truly not for your typical fountain pen user. I wonder what artists think of it. I watched Nathan’s LONG video and my understanding is this ink was designed for drawing not writing. I have not yet sampled the ink so my inpression is only from the information Nathan gives in the video. Yes indeed, though he has been promising an ink for writing that displays the same qualities. I did note that the ink might be better suited for art, but for writing it is a total nonstarter for me. Dang..wish I had seen this. Just got ahold of an Ahab and bought BNB to go with. Pretty color but disappointing because of the bleeding. Just plunged it out and filled with x-feather. Much better. I like the Noodlers pens for basic writing but still can’t get the effects of an oblique and flex dip nib.